Space Cadet seems to be “on a roll” – although his photographic skills may be getting rusty, poetry is keeping his creative juices flowing. 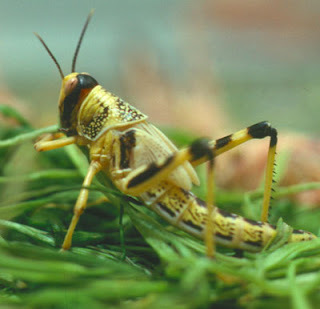 The Brooklyn-refugee confesses that he has never seen a live (or dead) locust; however, the Vacated Space that it symbolizes is quite familiar to him – and to us all! 1. The Vacated Space: According to the ARI zal, God’s first act of creation was to withdraw His Infinite Light, leaving the Chalal HaPanui, the “Void” or “Vacated Space” within which God reintroduces a Kav or “beam” of His Infinite Light. Within this Kav, all of the worlds and their constituent elements were brought into being. 2. One of the symbols for the Vacated Space is the kamtza, or locust, “whose outer covering is one with its inner form (she-levusho minei u-bei).” This alludes to the paradox that the Vacated Space nevertheless exists within God’s Infinitude. 4. The Vacated Space is described as “silent” because the divine speech, through which all creation comes into existence, is absent there. Hence the paradoxes and conundrums that proceed from the Vacated Space are unanswerable. 6. This silence emanates from Sovev Kol Almin, the transcendent Divine Oneness within which everything, including the Vacated Space, is subsumed. There, silence reigns eternally, because it is beyond the limitation and diversity of speech. 7. The Song of Redemption that Moshe will sing at the End of Days is bound up with this exalted level of faith. It comes forth from Sovev Kol Almin, from the silence of the Divine Oneness, and expresses the essential unity and harmony of all existence. 8. The mystical revelations of the “tzaddik in the category of Moshe” bear within them the awesome music of that all-encompassing song. 9. The “travelers” are those who make the pilgrimage to Uman for Rosh Hashanah, and who gather beside the river to cast away their sins during the Tashlikh ceremony. The “river” also alludes to the Vacated Space, which is traversed through faith. 10. The “promise” alludes to God’s vow through His prophets to redeem Israel. In Rabbi Nachman’s tale, “The Prince of Gems,” this corresponds to the promise of the tzaddik who blesses the king that he will have a son who is made entirely of gems. 11. The “serpent’s skin” is the Zohar’s term for the spiritual impurity that became part of human nature after the sin of the Tree of Knowledge. In Rabbi Nachman’s story, this corresponds to the leprosy that initially afflicts the king’s son. 12. When the leprous skin falls away, everyone sees that in truth, the prince is made of gems. Souls are compared to precious stones. Thus, the story suggests that the prince who is made entirely of gems is the Mashiach, who will be one with the soul within him, free from the Evil Inclination. The kabbalists explain that soul is a “chelek Eloka mi-ma’al,” “a portion of God Above” (so to speak), meaning that its existence is eternal and unconditioned, beyond all dualism and suffering. 13. Like Torah 64 and the resolution of the paradox of the Vacated Space that it discusses, the story of the Prince of Gems similarly alludes to the dissolution of the inner/outer dualism (leprous skin/diamond body). 14. In Torah 64, the undoing of the dualism (inner/outer, etc.) is related to the faith of the tzaddik; in the story it is less explicit, but seems to be implied by the destruction of the sorcerers (see there).